Businesses are an integral part of TaskRabbit, posting more than 35 percent of tasks. It’s been awesome to see how companies have used, and continue to use, the TaskRabbit platform to build and grow their business. To cater to these specific needs, we launched a dedicated TaskRabbit for Business dashboard back in February. “Over the past few months, we’ve noticed a trend in companies using the TaskRabbit platform as an easy and reliable way to staff temporary employees,” says Victor Echevarria, TaskRabbit’s Head of Business Development. The new TaskRabbit for Business experience makes it quick and easy to browse applications from high-quality candidates, screen and interview candidates online through a live chat feature, and hire and pay directly through the site. Leveraging LinkedIn’s API, each application offers a detailed and up-to-date summary of experience by pulling employment history and skills directly from the candidates’ Linkedin profiles. Beyond the ease and speed of use, TaskRabbit for Business offers companies the flexibility to classify their TaskRabbit as a 1099 contractor or W-2 employee (for jobs that take more than 15 hours per week) depending on their needs. All compliance paperwork, including payroll taxes, workers’ compensation and unemployment insurance, is handled for W-2 jobs. We’ve optimized TaskRabbit for Business to facilitate quick posting for administrative, customer service, sales, and data-entry jobs. During our beta period, these job types proved to be the most popular. 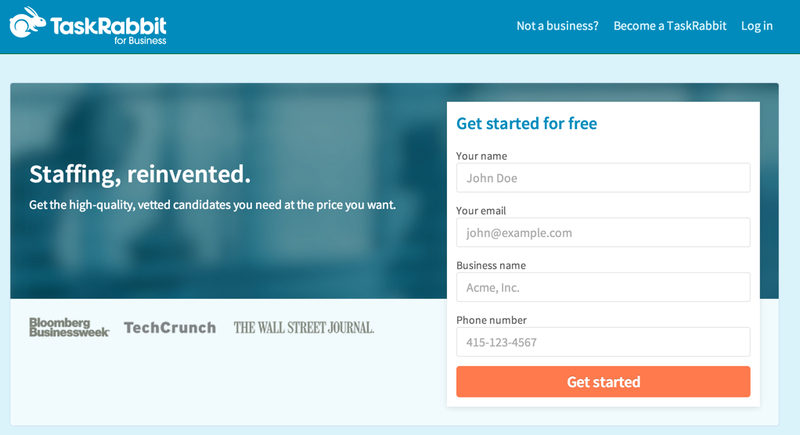 Yet, business users can easily customize job listings for any type of position. And, of course, all users can continue to post delivery and ad hoc tasks. Need help with a longer-term job?